160 pages | 23 B/W Illus. Sustainable communities raise questions about the compatibility of capitalism and environmentalism and how we can green our way of life in a capitalist economy that values short-term production and consumption over long-term conservation and simple living. If capitalism and its drive towards consumption has produced social and environmental degradation, is it the best medium to identify solutions? Sustainable Communities and Green Lifestyles　examines one ecovillage as it attempts to create a sense of community while reducing its impact on the natural environment. Through extensive participant observation, the book demonstrates how ecovillages are immersed within a larger discourse of class, race, and lifestyle choices, highlighting the inseparability of environmental sustainability and social justice. Sustainable communities are confronted by the contradictions of green consumption and must address social inequality or risk focusing inward on personal green consumerism, creating mere green havens for the few who can afford to live in them. 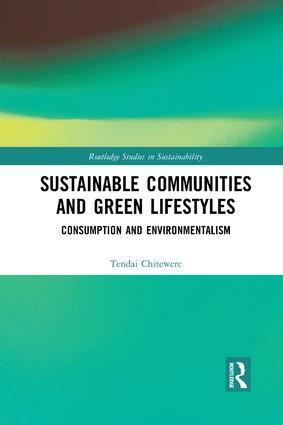 This book, cautious of redirecting environmentalist efforts away from structural solutions and onto personal environmentalism, offers a critical perspective on the challenges of an emerging green lifestyle. This book offers a critical perspective on the direction of US environmentalism and contributes to debates in environmental studies, anthropology, and urban planning. "The main argument of the book is that residents in EVI have primarily engaged in a green lifestyle that prioritises green consumption and personal benefits, over tackling structural or collective environmental injustices. As a result at various points in the book EVI is classified as a green-gated community, a themed idealised space, ageographic, an exclusive commodified space of experiences, an elitist place with exclusionary boundaries, an enclosure and a form of green flight. Far from being a model of sustainable living which all can enjoy, Chitewere details the many forms of exclusion, from the high costs of house purchase, to the time and energy demanded of residents to actively participate in communities and work teams, assumptions about the need for homogeneity for effective communal decision making, resistance to EVI being an educational space, and to how the green space EVI protects is actually “private-public space” (89) only accessible to members. As a result only those “with both the economic and social capital” (140), who have money but only work part-time or from home, basically who are upper-middle class and white, can join EVI." Tendai Chitewere is Associate Professor at San Francisco State University, USA.